It's time to cozy up, friends, it's getting cold outside! My favorite time of year is right around the corner. It starts the week of Thanksgiving, and ends at the strike of midnight on New Year's Eve. The holidays fill me with joy, as do the drop in temps that we've all been experiencing-even in the Arizona desert! While much of the country is covered in pretty white snow, Phoenix usually experiences beautiful sunny days with highs in the 60's, if we are lucky. Yet I yearn for the wintry white fluff and temps so cold you need many layers & warm Thai food to keep you warm. I have lived where it snows heavily twice (long term) in my life, while I attended Northern Arizona University in Flagstaff, AZ, and when I spent a year abroad in Strasbourg, France. Both climates experience very different winters, one being in the mountains, one in the center of Europe. While mountain winters are frigid and fresh, European winters boast a whole other type of cold-"Baltic" is the description I was told...a blast from the Baltic Sea. Both locales are stunning, both are the coldest spots I've ever lived in. So, yes, I know winter! What I love most about winter is the beautiful moments shared, cozying up by the fire sipping hot cocoa or malt wine, snuggling under a warm wool blanket, gazing outside to watch tiny snowflakes dancing in the wind-it is all glorious to me. I do miss the snow at times, although I never did enjoy stepping into a pile of snow, only to be met with and started by a pool of ice cold water soaking my feet, but its apart of winter as is the beauty of it all. Swooning as I am over snow filled winters I've experienced, today I felt it right to share some winter inspired boards to get in the mood for the coming season. 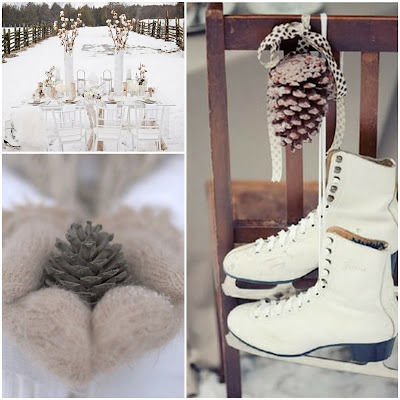 Using natural elements like pine cones and details like ice skates adds to inspire for decorating weddings and holiday gatherings. Of course a little sparkle and candle light never hurts! Each board embraces a different element of winter. Wintry Celebration has that rustic outdoor charm, with the table set in the countryside, with ice skates strewn over a chair. I love the image of the mittens holding the pine cone, it exudes a cozy warmth for a chilly celebration. Frosted Sparkle creates the mood for a glitzy little evening fête. The image of the candle amongst the silver ornaments and pine cones makes for a great centerpiece concept. I love the little cupcakes adorned with pearls, they are so sweet! As well the cupcakes with a little bling, anything that sparkles for a snow covered evening is a win in our books for sure! And lastly, Snowy Bliss combines the perfect touches of all things snowy, with little additions of beautiful pink flowers, ribbons & pine branches. I love the image of the beautiful bouquet on top of the sleigh! 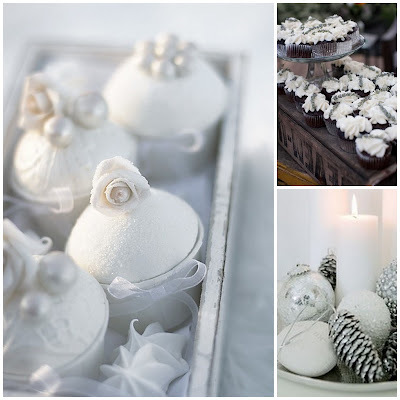 It's such a pretty idea to incorporate for a winter wedding. Placing little beverages in an aluminum bucked, filled with snow, adds a fun little touch as well. Including sprigs of pine branches brings in the natural elements, which is always a good thing. Are you as smitten with winter as I am? I wish I lived somewhere snowy to plan my own winter time affair. Each inspiration embraces a mood, and I am not sure which I swoon over more. Which is your favorite? 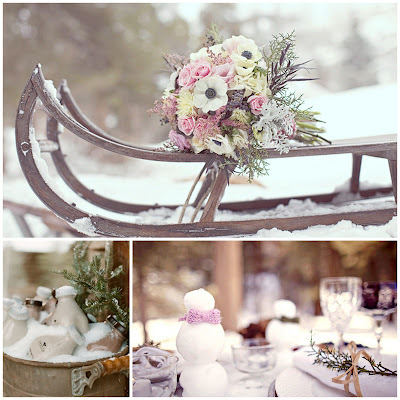 Gorgeous winter weddings are my favorite...especially when it has snowed...which never happens here! Love! Thanks for stopping by, Naomi! Yeah, snow never happens in my area either, but would love to attend a snowy wedding! I love when winter re-introduces white in a new way. White becomes the main color, with hints of golds, silvers and other soft hues. So enchanting! Aww, thanks, Brit! Winter is an enchanting time of year!